Kenzo Amour was probably designed around romance, passion and love. The shape of the bottle is certainly interesting as is the bottle design but the fragrance itself, as usual, has little to do with its ad. In Bottle: Like with all perfumes that use frangipani, I end up smelling that the most. It’s sweet little flowery self dominating the majority of this scent but there’s a bit of other stuff going on here too like this slightly powdery floral scent and an equally dominating vanilla note. Applied: Initial flare up of frangipani with a warm, creamy center. The fragrance gets a bit more floral as you keep wearing it as I presume either the heliotrope or the cherry blossom in this is trying to peak through. I get a slight powderiness in the fragrance, maybe it’s the rice? Not entirely sure what that is but it’s not strong and easily ignorable if you’re not looking for it. As Amour ages, the vanilla note gets stronger and comes up, bathing the whole fragrance in this creamy, milky, flowery concoction. Very nicely done actually. Amour is a rather comforting scent, not sure if I would associate it with passion but comfort is definitely there. The dry down is marked with a clean and still creamy vanilla scent. Extra: Kenzo Amour was composed by Daphne Bugey (Rose 31 for Le Labo, A Scent for Issey Miyake) and Olivier Cresp (Dune for Dior, Angel for Thierry Mugler, Elle for Yves Saint Laurent). Design: Amour comes in three colored bottles. Each of the colors represents a different amount. I believe the pink one is 30ml, the white is 50ml, and the orange is 100ml. The shape of the bottle reminds me a bit of Cashmere Mist by Donna Karan in that it has that swan-like shape. 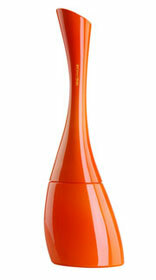 The bottle is easy to hold and manipulate despite is funky shape and the spray nozzle works just fine. Notes: Heliotrope, frangipani, tea, cherry blossom, rice, musk, vanilla. Amour is a well composed bit of fun. Very feminine and a good choice for most people (it leans a bit closer to the feminine side) of any age. It’s actually a great fragrance. But if you’re looking for passion, I’m not sure you’ll find it in this sweet milky flowery substance. Reviewed in This Post: Amour, 2009, Eau de Parfum. This entry was posted in floral, kenzo, oriental, Reviews By House and tagged cherry blossom, frangipani, heliotrope, musk, rice, tea, vanilla. Bookmark the permalink. Its a nice romantic and soft vanilla scent for grown women age 20+… The bottles are cute. I think its a softer and more milky version of Hypnotic Poison by Dior – which is a little bit stronger and perhaps more ‘passionate.’ Both are sensual, powdery, vanilla scented and mature though. Thanks for leaving a comment, anonymous. 😀 I like Amour more than Hypnotic Poison on some days. It’s softness is what sells it for me.